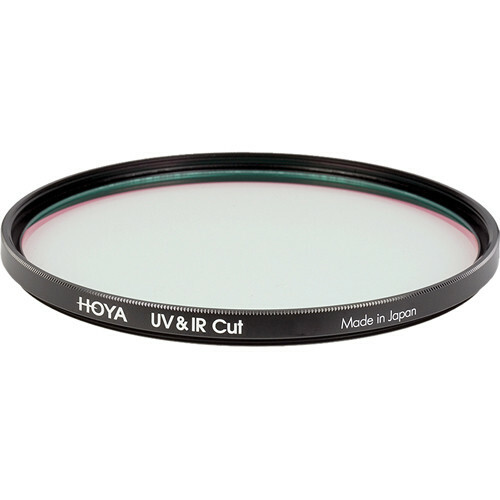 The 62 mm UV and IR Cut Filter from Hoya is a lens filter that, when attached to your lens, permits only the visible spectrum of light rays to enter the camera and get captured by the sensor. It blocks out both the higher frequency ultraviolet rays, and lower frequency infrared light rays. This is important to digital photographers because the CCD and CMOS sensors found in our cameras are extremely susceptible to catching UV and IR rays just outside the visible spectrum that have a very negative impact on image quality. The filter offers even greater versatility than is already found in a combination UV-IR filter due to its front and rear threads. They permit stackable standard-size filters to be attached, giving you even more filter effect options, while also accommodating a standard lens cap as well. Another benefit to using the UV-IR filter is that it can also reduce the effects of atmospheric haze to a greater degree than would be found with a standard UV filter. This means that sharper images with more depth and finer, richer color gradations are possible when utilizing the filter's effects in your photography. This combination filter is a very convenient option for those who seek a clearer and sharper image when captured outdoors, while getting the benefits of two filters in one. Box Dimensions (LxWxH) 4.4 x 3.8 x 0.5"
There is no filter factor for the Hoya 62mm UV and IR Cut Filter.